Launched in 2011, the Patient Access Symposium was the result of leaders in academic ambulatory care wanting to network with one another about access. While performing research for “Mastering Patient Flow: 4th Edition,” the author – Elizabeth Woodcock – reached out to colleagues for their perspective. These early discussions became the source of the original Patient Access Report. Many colleagues provided encouragement in developing a network of professionals interested in this topic. Hence, the inaugural Patient Access Symposium was held on May 19, 2011, drawing attendance from nearly 20 institutions. Participants appreciated the ability to be in a discussion-based forum, basing the moderation of the event off of the interviews that had been conducted in the fall. Elizabeth recognized that the key to success was not only to create a series of speakers to lecture on relevant topics, but to truly understand the initiatives at each institution and encourage participants to share that information. The Emory Clinic hosted the program in 2012, which included a pre-conference program to showcase the institution’s access strategies. The Atlanta-based symposium was held over two days – the first day as a pre-conference followed by a networking social event, and then the main forum taking place on the second day. The Patient Access Symposium has had the great fortune of having incredible host institutions year after year. They bring passion for improvement to each event and provide unparalleled knowledge and expertise. Host Institution: Vanderbilt University Medical Center. Awards of Excellence in Patient Access: Northwestern Medical Faculty Foundation, Vanderbilt University Medical Center and the University of Utah Health Care. The results of the first benchmarking study were also presented. Host institution: The University of Utah Health Care (UUHC). Awards of Excellence in Patient Access: Mayo Clinic, Stanford Hospital & Clinics and the University of Alabama Birmingham Health Care. 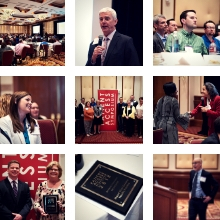 Pre-conference program included all of the latest in "lean" design and operations. Host institution: University of Alabama Birmingham (UAB) Medicine. Awards of Excellence in Patient Access: The Emory Clinic, Dartmouth-Hitchcock Medical Center and Geisinger Medical Center. Host institution: University of Washington (UW) Medicine. Awards of Excellence in Patient Access: Johns Hopkins Medicine, Henry Ford Health System, and UW Medicine. Highlights included workshops on call center management, ambulatory operations and capacity management. Host institution: The Mayo Clinic, Rochester, Minnesota. Awards of Excellence in Patient Access: Indiana University Health Physicians, the Ohio State University Wexner Medical Center, and Rush University Medical Group. Featured sessions included Predictive Analytics and an Executive Roundtable, as well as access-related solutions in a popular information system. Awards of Excellence in Patient Access: The University of Iowa Physicians, Duke Health, and UMass Memorial Healthcare. In the fall of 2018, the Patient Access Symposium changed its name to the Patient Access Collaborative, reflecting who they had truly become. The Patient Access Collaborative has donated more than $4,000 to charities, a gesture to show appreciation to the speakers and hosts who have provided the energy and passion to fuel the group. The Patient Access Collaborative will continue in its current format, with Elizabeth working to improve the value each year.